Your guide to the web's best nature & landscape photography sites. Nature Photography Workshops Now Available in Colorado & Utah! Collier, Grant - Variety of photos from Colorado, Utah, and beyond. Berenson, Mike - Images from Colorado, including some great night photos. Urbanski, Robert - B&W and infrared photos, mostly from Poland. Maraini, Silvio - Large format black and white landscape. Turner, Jeremy - Landscape photography from Australia, Zealand and Europe. Radeka, Lynn - B&W / color photos of the American West, plus posters and masking kits. Evans, Bob - Images of the Yosemite Valley, wildflowers, etc. Malvin, Larry - Traditional & digital images, mostly from the U.S.
Douglas, John	- Landscapes, wildlife, flowers, and digital compounds..
Caldas, Jose' - Variety of photos, mostly from Brazil. van Hoesel, Richard - Coastal and landscape photography from Australia. Vazquez, Antonio - Variety of photos from this Spanish photographer. Cook, Carl - Photos of birds, wolves, "other critters", and skulls. Grabowski, Bob - Photos from the Adirondacks, Yellowstone, etc. MacDonald, Mike - Nature & wildlife images, mostly from Chicago, Illinois. Olson, Jerry - Black & white images from the western U.S.
Scott, Ken - Light and landscape from the UK mountains and southwest USA. Roberts, Sam - Nature and adventure photos, mostly from California. Marchetti, Milko - Nature and wildlife images from Italy and Europe. Miller, Walt & Mimi - Underwater photography, plus flowers, etc. Cook, Andy - Photos of Colorado & the West. Harrington, Roy - Black & white photos from the western U.S.
Dore', Geoff - Nature & wildlife images, mostly from England. Falzone, Gian Luca - Nature & astronomy photos from Australia, Utah, Arizona, Italy, etc. Maslyar, Brian - Photos of the mountains, deserts, and forests of North America. Guy Tal - Fine art large and medium format images from America's wild places. Jess Lee - Nature, wildlife, and landscape photography. Westerberg, Ulf - Nature and travel photography. Randle, Scott - Surf & city photos along the west coast of California. Spano, Salvatore - Wildlife photography, wilderness, landscapes, and close-ups in nature. Hakala, Jari - Fine art and nature photography from Finland. Bulson, Ray - Landscapes, panoramas, wildflowers, and wildlife of Alaska. Dove, L.C. - Photos of animals, flowers, gardens, and landscapes. Wilion, Harold - Large collection of nature & wildlife images. Freeman, Carol - Marco-photography from a naturalist photographer. 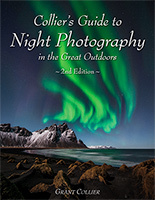 Click on "View Books" to view books by a given photographer. Please visit our friends' sites. 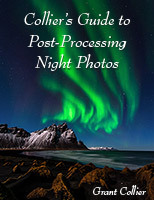 Site owned by Colorado photographer Grant Collier.